Good news for any owners of the Fiala family of guns. This includes those Fialas marked Schall & Co.; Columbia Arms Co.; and Botwinik Bros..
A retired gent in PA with a huge, well-equipped shop has fallen in love with working on older guns. He ran across a Fiala in need of some help and got hold of me. I've furnished him with original parts to use as patterns and he in turn has furnished me some new parts for my guns. The guy is a real artist. His work looks identical to the original and all I've used so far fit perfectly. He's asked me to pass the word as he now has the ability to make ANY part you might need for these guns. Just PM me with any Fiala part you might need. He's asked me to make up a list of needed parts so he has some idea of numbers before pricing his work. Here's a pic of one of my Fialas. Whoever said the pen is mightier than the sword obviously never encountered automatic weapons. ---General George S. Patton, Jr.
i really need to find a magazine for my fiala model 1920 pistol. 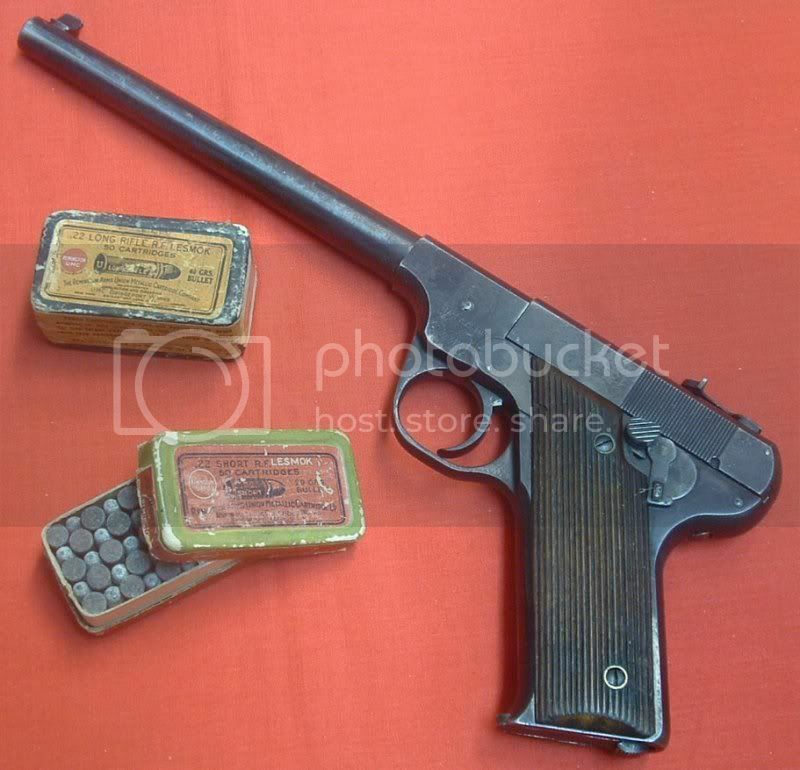 would this gentleman have a rear site for the fiala pistol and could i purchase this site and for what price? Regret to inform you that the gentleman, 45 Broomhandle, is deceased. I don't know if anyone has the information to reach the person that was making his parts. If no one has informed you previously, there are several magazines that will replace a fiala magazine ... old colt woodsman, Hartford, and most commonly available is Hi Standard model B ..
As for your need, if you have not found what you were seeking, I was blessed to obtain the last remaining (to my knowledge) fiala's from him .. and the person that sold them included a few of Mr. Meyer's fiala parts. I may have an extra sight among them if you need one. When firing the bolt on my gun comes back and hits you in the chest that’s not good! Any ideas on why that is happening? Thanks. I want to buy parts of my fiala, 45broom sir,where can i get it?